NEW HQL CLASSES ARE BEING ADDED DAILY. To reserve for these classes call 410-551-7777 OR 301-621-7777. Classes are filling rapidly so do not delay. This is a one-stop process with fingerprinting and preparation and filing of your Application. Classes are 6:00 p.m. to 8:30 p.m. on Monday and Tuesday. 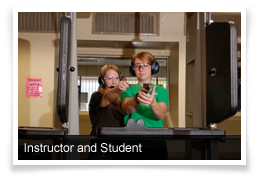 On Target announces that its next Handgun Qualification License (HQL) Training Class will be as above: Call today to determine available dates. Don't dally! Call or come in and register today! HQL Classes are available with fingerprinting service available after the first session. Additional classes MAY be added as the present dates become booked. The second session will include up to 50 rounds of live fire on the range with your instructor. The course has been divided into two sessions to accommodate those who find it difficult to spend 4 hours after a day at work. Each class is limited to 8-10 people providing personal attention both in the classroom and on the range. After completion of the Course there will be staff available to assist you in completion and submission of your Application online to MSP. The cost of the Training Class is $99 payable at the time of reservation. If you have a handgun and wish to use it for live fire you may bring it with you along with your own ammo if you wish or purchase ammo at On Target. If you do not have access to a handgun you may use, without charge, a range gun from On Target, however for safety reasons it is required that you purchase your ammo at the store for use in our guns. Upon completion (there is no “test”) you will have completed Step 1 of the licensing process. At the conclusion of the class you will receive a Completion Certificate and our staff will assist you with the filing of your Application to get the process started at MSP Licensing Division. The HQL Application must be submitted electronically. On Target has available three computers with capability to scan any documents that need to be submitted. The Application Fee charged by the State is $50 and must be paid by either MasterCard or VISA credit or debit cards as part of the submission. There will be people available to assist you with the Application process if you encounter any problems.